This month has been a busy one for river cruise shipbuilders as operators have been ordering them in series like railway carriages. By the end of the month, fully twenty-four new river cruisers will have been delivered in March, in time for the new 2014 season. 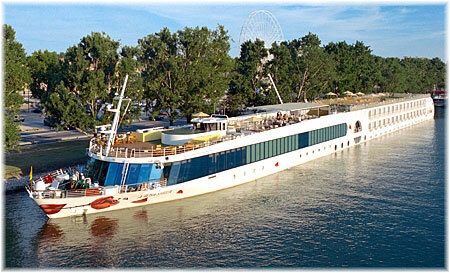 Three-quarters, or eighteen of these, are for Viking River Cruises alone. The decision has also now been made by MSC Cruises to build its latest “shorter but wider” class of mega ships at STX France and, as we guessed two weeks ago, they will feature an internal promenade. In the UK, meanwhile, it appears that CLIA slipped up when it lost 64,000 British cruisers between January and this month. 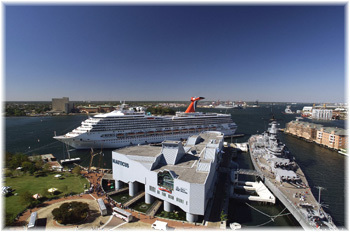 Finally, comes word that Carnival Splendor will mark a return to Norfolk by Carnival Cruise Lines when she arrives in 2015. Almost exactly a year ago, we brought you news that Viking River Cruises was christening ten river boats in one day. But this month not yet over is most certainly a record month for European river cruise ship christenings, with a total of twenty-four being added to the roster. Unlike Mississippi riverboats, most European river vessels have a low air profile in order to fit under low bridges, and carry between 140 and 200 passengers each. Of the twenty-four vessels, eighteen were christened last week for Viking Cruises. Nine were christened last Monday in Amsterdam. Three more were christened on Tuesday at a waterfront ceremony in Avignon, and four were christened simultaneously on Tuesday at the Neptun shipyard in Rostock, plus two on Friday in Portugal. The Portuguese pair, christened on March 21 in Porto, were completed to a shortened “Viking Longship” design, accommodating 106 passengers. Neptun Werft, where the Viking vessels are built, was founded in 1850 and has a long history in shipbuilding, concentrating mainly on merchant ship designs, but not without building ten U-Boats in 1943-44. 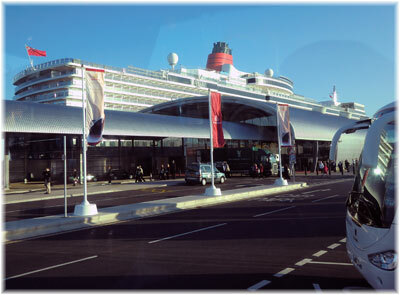 The yard, a subsidiary of Meyer Werft since 1997, also built ten river cruisers for A’Rosa River Cruises between 2002 and 2012. All vessels except the Portuguese pair are of the 190-berth “Viking Longship” series that includes the largest suites ever installed in a river ship in Europe, as well as cabins with balconies, a feature made possible by an new cabin area layout that includes offset corridors. With these additions, Viking will now have fifty-two vessels, up from thirty-five in 2013, with another dozen to come in 2015. With lines building river vessels in series like railway carriages, this unprecedented expansion has lead to Viking being Europe’s biggest river cruise operator by far. 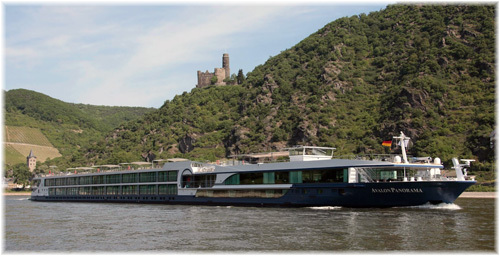 It also allows the line to operate river cruises in sections, so that two 190-berth vessels can accommodate 380 passengers on the same itinerary. Other christenings this month include two for Avalon Waterways, Avalon Impression and Avalon Poetry II, which were inaugurated on Saturday in Dordrecht, with a third vessel, Avalon Illumination, to follow in Vienna in June. 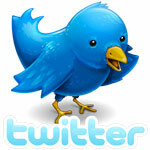 Founded in 2004, Avalon is owned by Globus of the United States and now has thirteen ships in operation in Europe. AMA Waterways is christening its own AmaReina in Amsterdam today while sister ship AmaSonata will follow in July, at Vilshofen on the German Danube. Founded in 2002, the line presently has a fleet of fifteen vessels and in addition to its American core ownership is now partly owned by APT of Australia. This Wednesday, Uniworld, represented in the UK by Titan, will christen its SS Catherine, sister ship of the SS Antoinette, in Lyon. Unusually for Europe, the 159-passenger SS Catherine will have a signature Leopard Lounge with leopard-print furnishings, elephant-head bar rails and other jungle-like elements. Other amenities include a mosaic-tiled pool and spa. Screen actress Catherine Deneuve will be her sponsor. 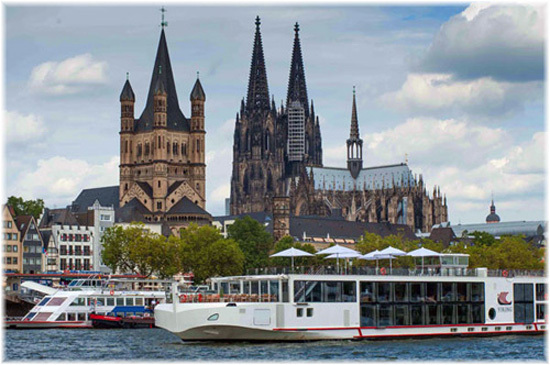 Finally, this Friday, CroisiEurope, a family-owned company that dates back to 1976, will christen another trio of river ships in its headquarters city of Strasbourg. The MS Lafayette, Anne-Marie and Madeleine will bring its fleet to thirty-three vessels in Europe. In addition to operating the small 200-berth seagoing cruise ship La Belle de l’Adriatique under the CroisiMer banner, CroisiEurope last year introduced three smaller canal barge cruisers. 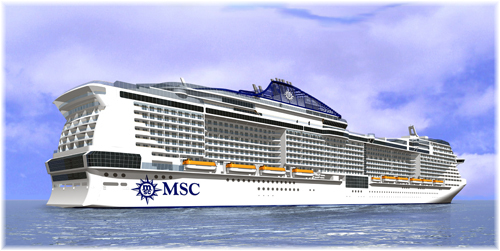 Two weeks ago, we mentioned that MSC Cruises was in negotiation with STX France and Fincantieri for its next class of cruise ship, not as long as but wider than the “MSC Fantasia” class ships, with more than 4,000 lower berths. The two units are due for delivery respectively in 2017 and 2019. Now that decision has been made with the placing of a Letter of Intent with STX France for two ships, for delivery in 2017 and 2019, and an option for a further two. Something we surmised when MSC said the ship would be “shorter but wider” than the “MSC Fantasia” class was that MSC might be the first other than Silja Line and Royal Caribbean International to introduce internal promenades. Sure enough, MSC’s latest announcement makes mention of a “two-deck inside promenade,” although as yet it gives no further details on how these will be executed. The Passenger Space Ratio (PSR = gross tons per passenger) on the new MSC ships will be low at 37.2 compared to 41.1 on the “MSC Fantasia” class, or about 12% lower, and very low at 29.4 when fully booked (Oasis of the Seas’ PSR is 35.4 when full). 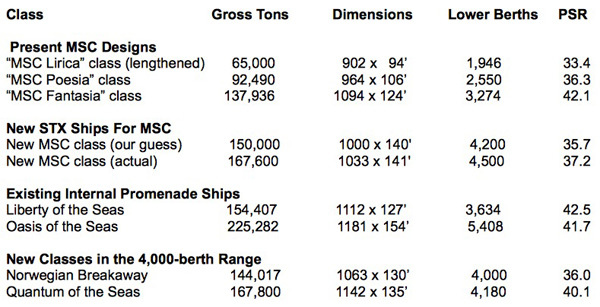 Length to Beam ratio will be 7.3 compared to 8.8 on the “MSC Fantasia” class, meaning the new ships will be about 20% wider. The new lower length makes it easier to get into many ports in the Mediterranean. Credit for this story goes to David Monk and his blog Shipmonk, for recognizing a major discrepancy in the numbers of Britons reported to have gone cruising last year. In January, announcing a 5% increase in UK cruise passengers, CLIA UK and Ireland released statistics saying that 1,790,000 Brits had cruised the previous year, up 89,000 on 2012. During Cruise Shipping Miami earlier this month CLIA Europe released new figures saying that the number of UK cruisers in 2013 had been 1,726,000, up only 25,000 on 2012. The difference is 64,000 passengers and the new figure means that the actual increase 2013 over 2012 in the UK was only 1% and not 5% as had been announced in January. We all know that certain UK lines have been carrying fewer passengers but we wonder how such a large discrepancy could come about. A difference of 64,000 is enough to fill Fred Olsen’s 809-berth Boudicca for two years or the 2,620-berth Queen Mary 2 almost twenty-five times across the Atlantic! The good news for UK ports is that the number of Brits embarking in the UK is rapidly approaching a million. Only last June it was announced that Carnival Cruise Lines was leaving Norfolk, when it shifted its 2,974-berth Carnival Glory to Miami year round in October. Royal Caribbean International had already abandoned the Virginia port in 2010. The reason given for leaving was the significantly higher fuel costs caused by the new North American Emission Control Area forcing ships to burn more expensive fuel within 200 miles of land. But now comes news that starting in May 2015, the Carnival Splendor, sister ship of the Carnival Glory, will offer a Norfolk program. This will include: a 2-day sampler cruise leaving May 16, three 5-day Bahamas cruises to Nassau and Freeport departing two in May and one in October, a 6-day Bahamas cruise in October calling at Half Moon Cay as well as Nassau and Freeport, and a 7-night Bermuda cruise on October 23 that features three days in Bermuda, an island that is not regularly served by Carnival Cruise Lines. No mention was made of the Emission Control Area in connection with Carnival’s return, although it was mentioned that an estimated 8.1 million adults living within a five-hour drive of Norfolk are likely to take a cruise over the next three years. The Carnival Splendor will also sail seasonally from New York and Miami in 2015. Between April and November, she will operate a number 4- to 8-night itineraries from New York to ports in the Bahamas, the Caribbean, Canada and Florida. Offerings from New York to the Canadian Maritimes include short 4-night cruises visiting Saint John and 5-night sailings calling at both Saint John and Halifax. Seven-night autumn foliage cruises call at Boston, Portland, Saint John and Halifax, while three different 8-night options will be available, including a Bahamas/Florida itinerary calling at Port Canaveral, Freeport and Nassau and two eastern Caribbean routes, one featuring San Juan, St. Thomas and Grand Turk, and the other Grand Turk, Nassau and Half Moon Cay. From November 2015 through to April 2016 Carnival Splendor will sail 7-night eastern and western Caribbean cruises from Miami.